I saw this Robert Cormier quote over at Kim’s Write Shop blog and knew that I had to share it with the middle schoolers who come to our peer editing session. What a great reminder that our writing is flexible. It can and should change as we revise, edit, and proofread. There is no shame in making mistakes and having a very rough rough draft — as long as you keep working on it. 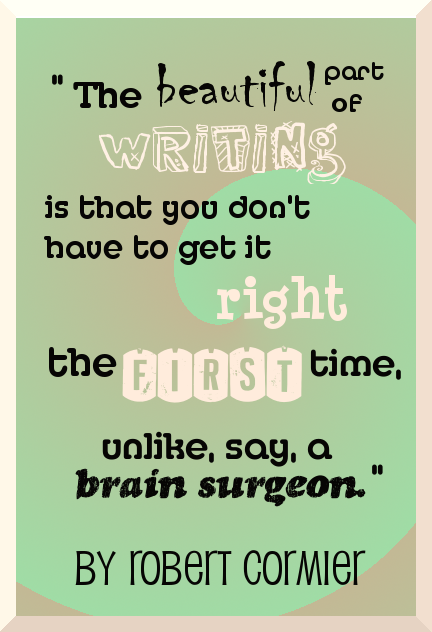 Now if we can only convince our teen writers that they are not brain surgeons! It is a mentally challenging task to revise your own work, even after getting feedback from others. And it takes a lot of time, as Kim points out. But it is also highly rewarding to invest time into a piece that ends up being something you are truly proud of. Besides the pretty graphic above, I made the quote into a printable, black and white mini-poster that you can use to inspire your young writer or yourself! Download the B&W mini-poster here. I hope that these words from a published author will encourage the tweens and teens I work with to be confident writers at all stages in the process. Don’t you just love to find that perfect, inspirational quote that encourages, motivates, or just plain frees you? I really like that and might need to print it out. laminate it and put it up on my school room wall. I plan to share with my daughter who likes to write, but does not like to edit. Love it! It’s good for all of us (not just the middle schoolers!). Encouraging to our teens…and just as encouraging to me! 🙂 Thanks for posting. Love it! 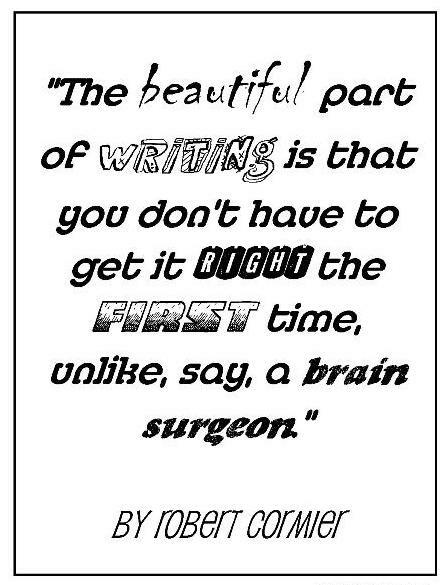 It is perfect for my 12 year old who loves to write but doesn’t see the point in editing and rewriting…. For aspiring writers, there can be no better mentor than Robert Cormier. His books are masterpieces of concise, emotionally honest writing. I highly recommend his novels I Am the Cheese, After the First Death, Tenderness, and The Chocolate War.